Bold Lentil: Welcome Bulgaria! What's the Deal Wyoming? Welcome Bulgaria! What's the Deal Wyoming? Checked analytics for the first time this year and while the intention is still to stay off analytics the stats were a good distraction. 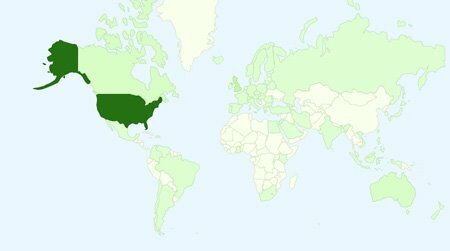 From the worldwide map of visitors, someone from Bulgaria has found bold lentil. Welcome. Fine. 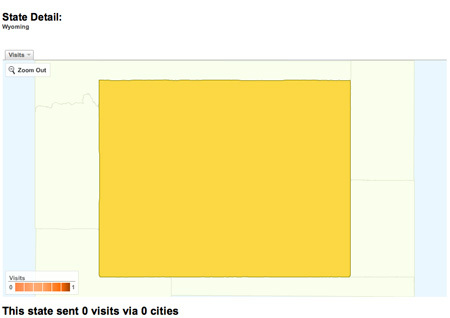 Time to do some research and post some more topics of interest to people from Wyoming. But wait isn't this just blogging for the map? Some kind of abstract collection on a color coded map. But if the goal is to get a visitor from every state, every country even then how does the task of blogging shift? Instead of a narrow topical focus that reflects from personal interests out, the writing has to be diverse, localized and more a reflection of potential visitors interests. Blogging from the outside in, so to speak. Might even be cheaper than collecting $12.50 in state quarters.